Our Marketplace is extended to Sunday, Nov. 20th, 9 – 2! 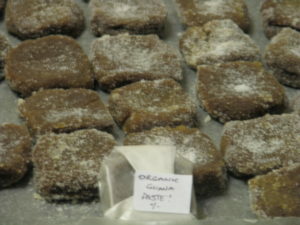 Guava Paste squares – eat as is or put them in baked goods, or pair with slices of cheese. Ummm! Frozen Pomegranate Arils, all ready to sprinkle on your baked goods or mix in a salad or stuffing. 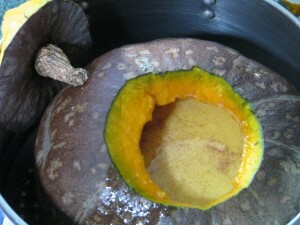 Frozen strained cooked organic home-grown pumpkin, all ready for a pie or bread! Gingerbread Houses. Pair them with our Passionfruit Curd for a memorable dessert! Lilikoi (Passionfruit) Poundcakes. 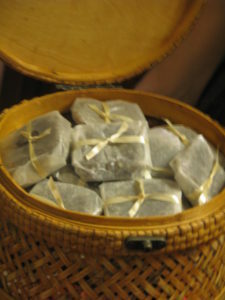 Small amazing tropical bundles of yum. 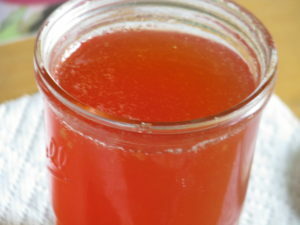 Guava Sauce, like applesauce but guava. Very low sugar! Fresh Jerusalem Artichoke (Sunchoke) roots. Cook them or plant them! Layered Curry Mix – a sensual trip to the Middle East, either layered in cute little jars for a gift or in bags for use at home. Make a curry with these organic spices! Candied Orange Peels. From our organic oranges. A much better stocking stuffer than hard candy. Or top your baked goods with a twist. Fresh kiwanos, those thorny African fruit that sell for a fortune at the stores. Plus, we’ll be selling some knick-knacks, and a few garage sale items . A punching bag anyone? PLUS, we’ll have a selection of native plants lovingly grown locally. And we’ll have amazing succulents from our neighbor Rosa of Roja’s Succulents. You’ll pass by her business on the way in, so please stop by on the way out and see her incredible inventory of plants, all organically hand-grown by Rosa. I never loved succulents until I saw her collection, and her very low prices! Except for the gelato, we’re dairy (milk) free this year. We use organic eggs from cage-free hens, and otherwise use vegan butter that I make at home which is coconut-oil and rice milk based. Our last two tours of the year (the garden closes from Thanksgiving until March 1. We will still be available for consultations and appearances) will be this weekend, Nov. 19th and 20th, both at 10. [UPDATE: THE SATURDAY TOUR IS FULL. THERE IS STILL ROOM FOR THE SUNDAY TOUR]. 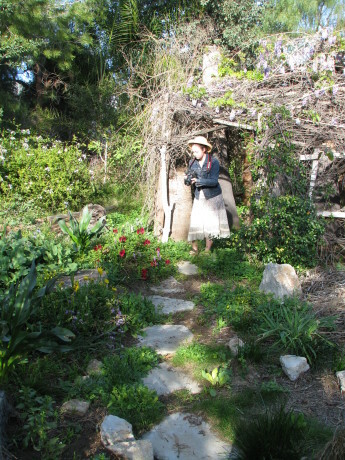 The tours are our usual 2-hour concentrated Intro to Permaculture walks through the garden. The tours cost $15/adult and you will come away with so many ideas and so much information that you’ll spend the next week working in your garden! Please RSVP for the tours to dianeckennedy@prodigy.net. Your continued support helps Miranda and I keep our consultation and tour prices low, and enables us to keep teaching and spreading the word on permaculture. So thank you! I’ve labeled myself an ‘ethical vegetarian’ for nearly two decades. I stopped eating animals when I became horrified at the dichotomy of having glue traps under the house to catch wild rats and mice (and any poor, poor animal that happened upon it, such as lizards. Glue traps are horrendously cruel. I hadn’t put them there.) and a cage with an exercise wheel and specialty food for ‘pet’ mice in the bathroom. Justice is a man-made effort, and by not eating animals I was no longer approving of mass torture by buying into it. Although I no longer ate animals, I have still indulged in animal products, namely dairy products. Slowly it has sunk in how badly animals are treated for those, too. As someone who loves cooking, it has been difficult for me to wean away from dairy products. Butter is especially difficult. Unlike hens who have been bred to continuously lay without needing the services of a rooster, dairy cows must be lactating to produce milk. Cows are usually artificially inseminated, then after giving birth their calves are replaced by milking machines. The calves are most often slaughtered for veal. This process is repeated until the cow is used up from the constant pregnancies and lactating, and then she is slaughtered. This horrible practice is disguised by advertisements showing happy cows grazing in fields. That is a fantasy. ‘Grass fed’ and ‘pasture raised’ are sly terms that give you an image that is nowhere near to the truth. Please read Michael Pollen’s Omnivore’s Dilemma to understand where your food comes from and why. To find an acceptable butter substitute has been an expensive and frustrating endeavor. For awhile I used a dairy substitute from Trader Joe’s, who I swear keeps tabs on what I buy the most and then discontinues it. All other butter substitutes either taste horrible, can only be used for spreading, or more commonly contain palm oil. The sudden fad for palm oil has created extreme clearance for the growing of palm in the areas which are habitat for the orangutan; indeed, if we don’t curtail our consumption of palm oil quickly the orangutan will go extinct within our lifetimes. I finally found a recipe for a butter substitute that works pretty well for both spreading and baking. It is made mostly of refined coconut oil. At this point coconut oil is sustainably produced – please make sure that you support companies that do so. Refined organic coconut oil has no flavor or scent; unrefined has a mild coconut flavor and a toasted coconut scent. If you are using a batch of this butter for baking where coconut flavor is desired, then use the unrefined. This recipe is by no means my own. I found it and a detailed description of the science behind it at VeganBaking.net . There are several options listed and a lot of cooking science behind the butter. The mouth-feel is amazingly creamy and satisfying. I used the basic recipe, Regular Vegan Butter, Coconut Oil Base. 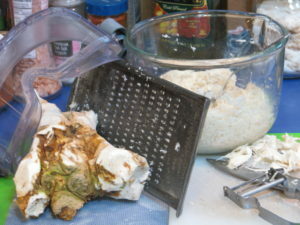 The recipe calls for curdling the soy milk, which will drive the butter flavor. I tried the full teaspoon of cider vinegar, then half cider vinegar and half coconut vinegar, then just half a teaspoon of coconut vinegar, and finally no vinegar, and thus no curdling, at all. I found for my taste that the vinegar flavor carried through and was much too dominant. Even at just half a teaspoon it was so noticeable to me that I didn’t like it on toast. It was good, however, when my daughter used it on sourdough and topped it with fresh avocado. The slight vinegar flavor enhanced the avocado deliciously. The batch I made without vinegar seemed perfect. The mouth-feel of this butter with or without the vinegar is creamy and all that a high-fat butter should be. It looks, cuts and spreads like butter. The flavor is creamy and very mild, almost like a slightly salted sweet butter. This was a winner for me. For the soy milk I used Trader Joe’s Organic Plain, which does have some sweetener in it. I’ll try with an unsweetened plain organic soy milk another time. I keep my butter on the counter. I know that organic butter holds its shape better in the heat than processed butter, but both stay stable unless the temperature is in the 80’s. Coconut oil melts at 76F, and in my summertime Southern Californian kitchen, this vegan butter must be kept in the refrigerator. The butter is hard when needed, so the next batch I will take the author’s advice and swap out a tablespoon of coconut oil with regular oil to make it more spreadable. I wanted to test the butter in cooking and baking. I melted it in a pan and cooked eggs and other breakfast items in it successfully. I used it on toast and on mashed potatoes with great success. The experiment with shortbread cookies went wrong, however, but I don’t think that that was the butter’s fault. These were lemon rosemary shortbread cookies, and contrary to my baking sense I followed the author’s (another blog) directions and didn’t sift the powdered sugar before adding it. There were lumps, therefore, in the batter and I mixed it extra to try and beat them out, which I believe was responsible for making the cookies tough. They were flavorful, but not crumbly. Oh well, I’ll just have to try again! 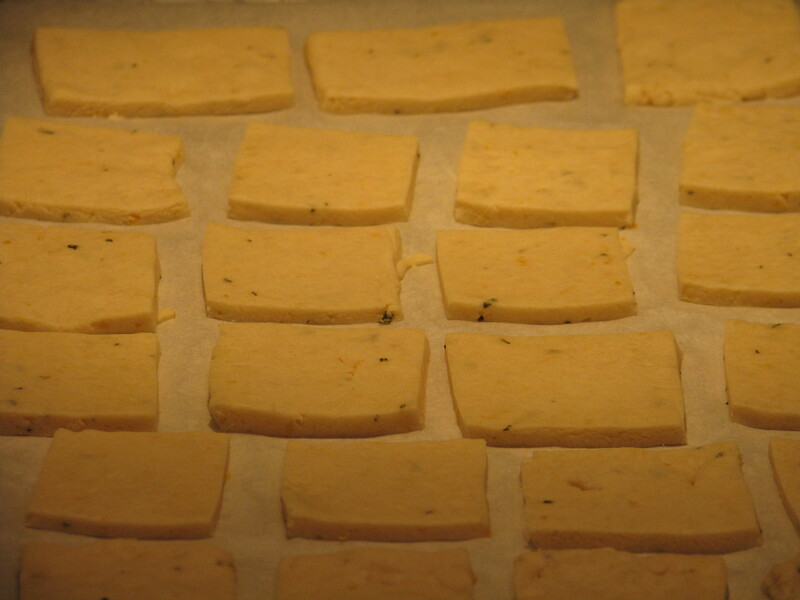 The cookies rolled out, cut, and baked well, retaining their shape and performing as well as with cow’s butter. Shortbread didn’t spread using this butter, which was great. I don’t have a finished photo of the lemon-rosemary cookies because, well, they were eaten. As with all substitutions, there is always a difference and vegetarians and vegans have to embrace it. Of course fake bacon and ground ‘meat’ is not quite the same: the great part is that it is far more healthy for your body (lower fat, few preservatives if any, often organic, and not the pesticide-drenched and drugged animals that people eat) and doesn’t perpetuate the extreme cruelty to animals about which humans have become nonchalant. Yes, other animals aren’t kind when feeding off of other animals (those which aren’t vegetarians). Yet we as humans have the option the others don’t, to make eating choices. Here is the basic revised recipe; please see the original blogpost on VeganBaking.net and give the options a try. I found xanthan gum from Bob’s Red Mill at my local grocery store, and liquid lecithin and coconut vinegar online through Amazon.com. You can double or triple the recipe with no problem! Enjoy. Recipe update: I’ve since made some changes to the recipe, exchanging some vegetable oil for some coconut oil for more spreadability, and adding a little more salt for a more satisfying (to me) taste when spread on toast. I’ve been using this butter for a month now, and have noted that: when melting in a hot pan it will brown faster than regular butter, so keep the temperature down, that it will melt and separate at room temperature (its summer now, so the kitchen is usually in the 70’s – in the winter it will be different) so I keep it in the refrigerator. I found butter stick molds that have the teaspoon markings along the side, so I’ve made 8x the original recipe and poured it into the butter molds, then wrapped each unmolded stick in wax paper and frozen them. Vegan butter sticks with teaspoon markings along the side for ease in baking. I’ve also poured it back into the cleaned coconut oil jars and frozen them, keeping one in the refrigerator for unmeasured use. I’ve used it along with a non-dairy creamer in the Chocolate Ganache recipe and it is very chocolaty, but not as rich as the original. Part of that is due to the creamer; heavier creamer will produce creamier results, but in no way was it disappointing. It was very tasty, but not as heavy. When refrigerated it didn’t solidify as much as the other, so more chocolate might need to be added depending upon the type of creamer used but it was still spreadable and yummy. I’ve been making the butter with unsweetened organic rice milk and it turns out well. 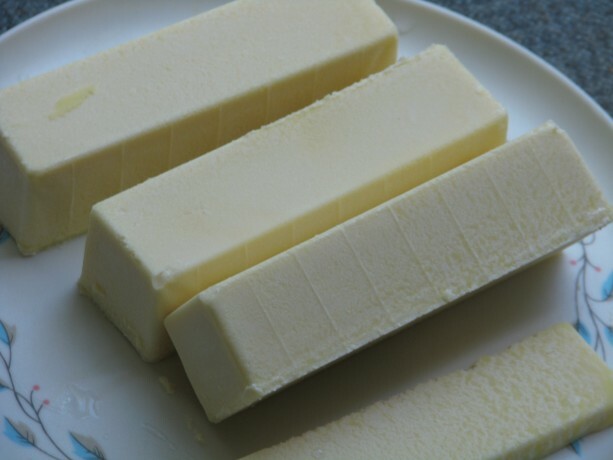 At first it tasted too light to be satisfying, but when I had dairy butter at a restaurant it tasted greasy and heavy – my taste buds wanted the vegan butter! I found out that even when the kitchen is colder than the melting point of the coconut oil, it isn’t a good idea to leave the butter refrigerated because unlike dairy butter it will grow mold. 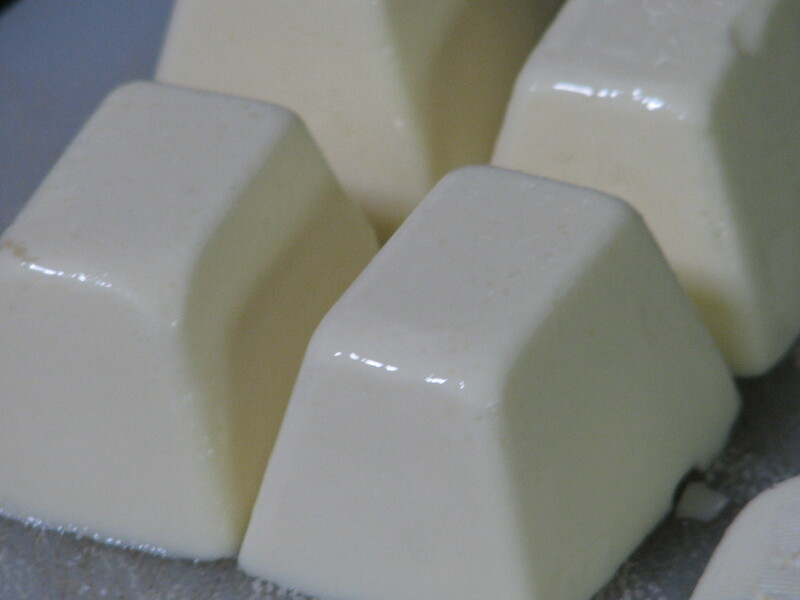 The rice milk butter with the increased vegetable oil makes it perfectly usable from the refrigerator. I make sticks and freeze them in a freezer bag for baking and pour the rest into glass jars with screw-on caps for spreading. 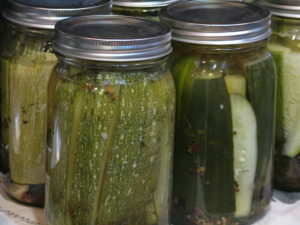 The jars are kept in the freezer until needed, then switched to the refrigerator. I’ve made biscuits, cookies, cakes, scones and breads with this butter, and with proper handling they all come out just fine. We offered both dairy and vegan butter to our holiday guests and they didn’t detect much of a difference. Since vegan butter is so much lower in calories, and coconut oil is so good for you, I don’t have to hesitate to use it. It is actually part of my weight maintenance program! A wonderful vegan butter with no palm oil, but lots of options. My version is without curdling the soy milk. Please see the original excellent post for more explanations and options. Combine soy milk and salt in a food processor or blender. Melt the coconut oil until it is just room temperature and barely melted. Add the coconut oil and the rest of the ingredients to the soy milk. Blend or process for about 2 minutes on low. Pour into ice cube trays, or into butter molds or trays. Freeze until firm, about an hour. Keep wrapped in refrigerator for a month, or frozen for a year. OMG! How could I not have told you about clafoutis yet? If you have ripe plums, peaches, apricots… any stonefruit… and you need something to do with them, this is it! Clafoutis (clow-FOO-tee) is a baked dessert (or breakfast!) that is simple to make and absolutely yummy. Ripe fruit, especially those that are a little too ripe to eat fresh because of the texture, is topped with a flour and custard batter and baked. Serve plum clafouti warm or at room temperature. So yum. Because of its simple ingredients and low sugar, clafouti is wonderful for breakfast. Peach clafouti is shown here along with asparagus and soy sausage. is good with ice cream, but just powdered sugar on top for decoration or plain is fine. You can make it with liquid egg substitute and non-dairy milk substitutes; I used our hen’s eggs and organic soy milk. Plums are absolutely delicious in a clafoutis, but we’ve used peaches and apricots as well with great results. A simple and delicious baked fruit dessert. Move oven rack to the middle and heat to 400F. Place butter in a 9 x 13 inch baking dish and put in oven to melt butter. In a medium bowl, toss the plums with ¼ cup sugar. With oven mitts, remove hot dish from oven and swirl melted butter to coat bottom and partially up the sides. Spread plums evenly on bottom of baking dish. In a medium bowl, whisk the eggs until blended. In a separate bowl, whisk the remaining ¼ cup sugar with the flour and salt. Whisk the sugar and flour mixture into the eggs. Whisk in the milk, vanilla and almond extracts. Pour the batter evenly over the plums. Bake 40 - 45 minutes until the clafoutis is lightly browned and the center has puffed up. Dust with confectioner's sugar and serve warm, plain or with ice cream. Or hard sauce. Or whatever you like. Use a French accent when announcing dessert. 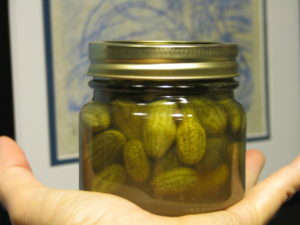 Eat within a couple of days or it becomes soggy. It is melon time in the garden. Fresh green melons served with a little lime juice, or fresh orange melons served with a little lemon juice, are just heaven. When you have too many melons, it is time to look for things to do with them. Last year we froze melon slices in a mild sugar syrup. This worked well when using the melons in something; the texture was too goopy for eating fresh with any pleasure. This year I found a recipe in my Baker Creek Heirloom Seed catalog for melon pie. Melon pie? I did a little Googling on the subject and found a lot of melon pie, cake and bread recipes. Who knew? Well, not me anyway. This recipe works for any melon, the more fragrant the better. It was written for Mother Mary’s Pie Melon, an heirloom that we grew this year. 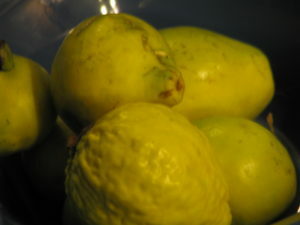 It is small and fragrant, and just makes the right amount of melon the recipe. The version of the recipe in the catalog – which is also in their book The Baker Creek Vegan Cookbook – is vegan. I’ve changed it to vegetarian and you can do what you want with it. The cookie-like crust paired with the creamy yet firm filling is wonderful. Top it with a little whipped cream! They suggest topping with toasted coconut, but I’m not that much of a coconut fan. However I could really see this topped with merangue, like a lemon merangue pie. Yep. A fragrant, yummy pie with a perfumy melon flavor and crisp cookie crust. Prepare crust: beat butter and sugar in mixer until fluffy. Add flour and mix thoroughly. Press into bottom and sides of a 9" pie pan. Bake crust at 375F for 10 - 12 minutes until lightly browned. Meanwhile, stir sugar and cornstarch together in medium saucepan and set aside. Blend egg, melon and water together until smooth. 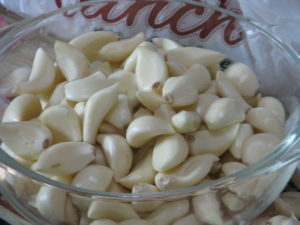 Over medium heat, gradually stir melon mixture into cornstarch mixture, stirring constantly until mixture thickens and begins to boil, about ten minutes. Don't rush! Reduce heat and cook 1 minute more. Remove from heat and stir in 3 T butter and lemon juice. Pour into pie shell, cool and then refrigerate at least an hour before serving. Serve with whipped cream... or not. This is an interesting and delicious way to use some of those plums that ripen overnight. Basil is also in season, and combining it with the heavenly, winey flavor of ripe black plums is amazing. If you grow other types of basil such as lime basil or cinnamon basil, use those instead, reducing the lime juice to 1 tablespoon. Granita is juice that is partially frozen, forked around a little, then refrozen. You don’t need an ice cream maker. Easy, quick and nutritious, too! 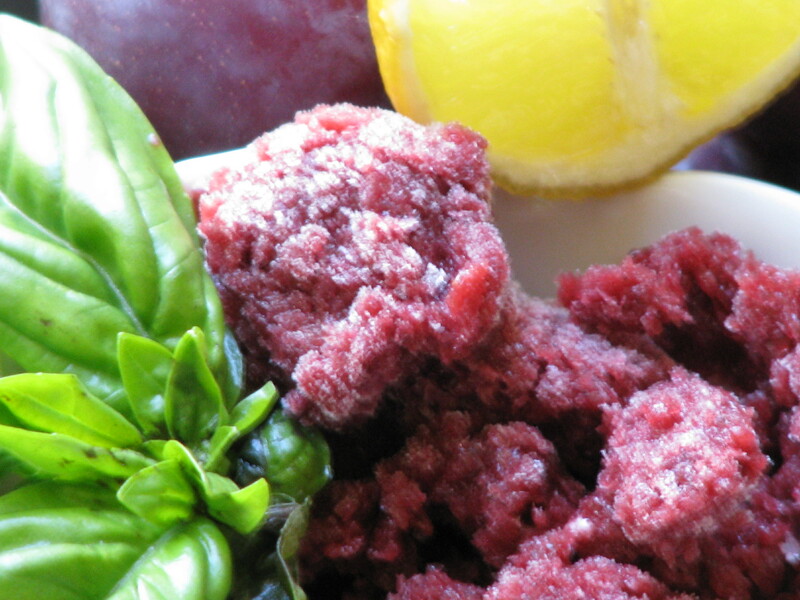 Basil and allspice give a wonderful depth of flavor to winey black plums in this frozen treat. In a large saucepan combine water, sugar, vanilla, salt, allspice and prepared plums and bring to a boil. Reduce heat and simmer for 15 minutes or so, stirring occasionally, until the plums begin to fall apart. Pour into a small bowl set in ice water in a larger bowl and cool completely. Fish out and discard the six allspice. 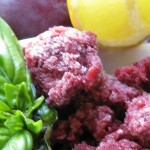 In a blender or VitaMix process plum mixture, basil and lime juice until well blended. 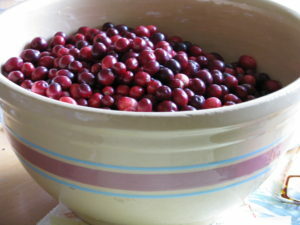 Press the plum mixture through a fine sieve over a bowl and discard solids. If you have a VitaMix you may not have any residual solids; the granita will be cloudier but will be more nutritious. Don't worry about it. Pour the mixture into an 8-inch square glass or ceramic baking dish. Cover and freeze until partially frozen, about 2 hours. Scrape with a fork, crushing any lumps, and smooth down again. 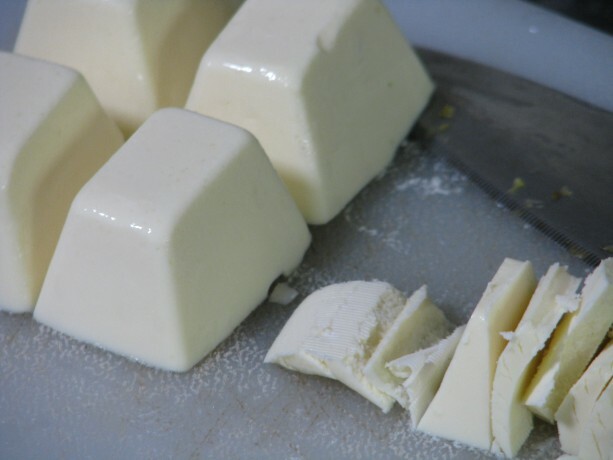 Freeze for 3 more hours, scraping with a fork every hour so that it doesn't freeze as a cube, until completely frozen. Serve in small scoops; really nice paired with little vanilla cookies. Cocoa + squash + habinero = YUM. My collegiate daughter needed a recipe to use up leftover frozen kabocha squash. 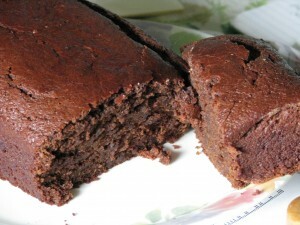 She found a chocolate kabocha bread recipe, adapted it for ingredients she had on hand, and sent me the recipe. I’m such a proud foodie mom: this is the first recipe she’s sent to me. She had substituted yogurt for the oil, and only had cinnamon as a spice, but really liked the results. She said that it was kind of like hot chocolate in bread form; not too sweet and not too plain. Hot chocolate in bread form? I’m so there. Today has been cold and a little rainy. My shoes and socks were wet from standing in wet grass trying to coerce my 100-lb tortoise back inside his heated room before he became too cold to move. I had some thawed pink banana squash puree leftover from making pumpkin scones for my son last weekend. It was so squash bread time. I had all the spices, but I changed them up a little. I added some freshly ground nutmeg in place of some of the cinnamon. Due to conversations with others in my exercise class about eating fresh homegrown fruit with chili pepper and other warming spices sprinkled on them (spring fantasies!) I thought I’d heat up this recipe, too. Before Christmas I purchased some habinero powder at Old Town Spice Merchants in Temecula, and fell in love with their habinero sugar which they sprinkled over samples of dark chocolate brownies. I added some habinero powder to this recipe and it is fantastic. The loaf took an hour and five minutes to bake. It was slightly crispy on the crust and dense, moist and dark on the inside. Yet it wasn’t cloyingly heavy or too wet. The cocoa flavor was satisfying; too often cocoa recipes taste as if the chocolate was just a coloring rather than a flavoring. This was good. The spices were just enough and not overpowering. The habinero powder was just right, making just a little heat in the mouth that really accented the chocolate flavor and warmed me up from the inside. I am freezing the rest of it, just so I don’t eat any more today. It was really wonderful, and it had vegetable in it, too! Thanks, daughter of mine! I’m sure you could eat this with cream cheese, marscapone cheese, or dust it with powedered sugar, but it doesn’t need anything. Not even, apparently in my case, a fork or plate. So much for dieting today. Like spicy hot chocolate in bread form. Grease and lightly flour an 8½ x 4½ inch loafpan. In a large bowl combine the oil, puree and egg until well combined. Beat in dry ingredients until well blended. (If using electric mixer, beat on low speed. You don't want a lot of air in the batter). Bake 350 degrees F for 1 hour and five minutes, or until a toothpick stuck into the center comes out clean. Cool on a wire rack for fifteen minutes then cut around loaf and turn out onto a plate or wire rack. Serve warm, or any way you'd like to! (Options: serve with cream cheese, marscapone cheese, or dust with powdered sugar. It is also great drizzled with chocolate frosting (what isn't?) or with chocolate ganache. Both recipes can be found on my blogpost on Buttermilk Chocolate Ganache Cake). I know that you lose sleep over trying to figure out how to get more vegetables into your dessert. Well, snuggle up for a good long snooze, because here’s a recipe to bring you peace! 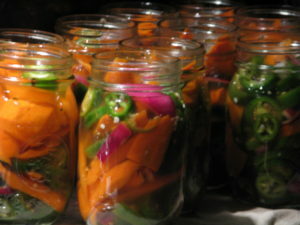 I found this recipe in the Heirloom Gardener Winter 2012- 2013 edition. 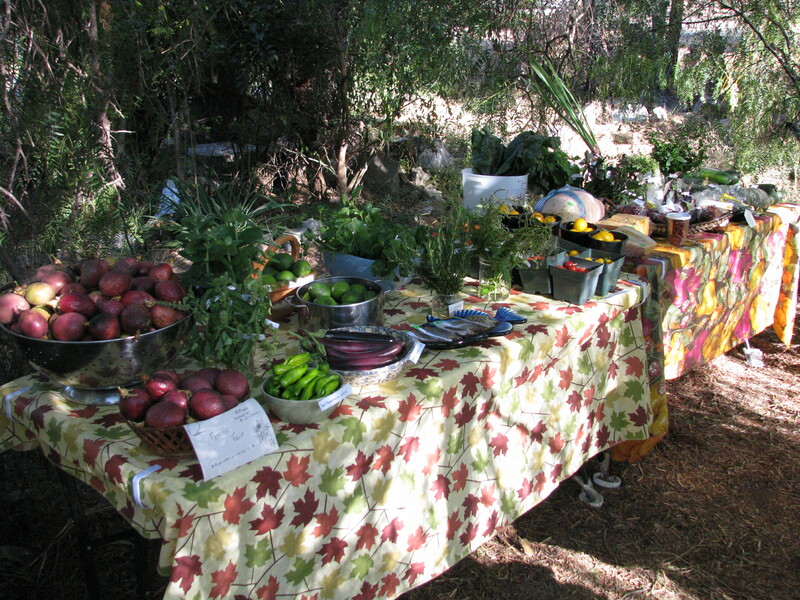 The magazine is created by the people who bring you Baker Creek Heirloom Seeds (organic). A wonderful article about Thai cooking by Wendy Kiang-Spray features this intriguing recipe, and I had to try it. 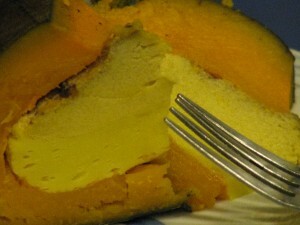 You hollow out a small Thai or Kabocha squash (they are drier in texture), fill it with a coconut milk custard, steam it, and Bob’s your uncle! Scoop out the seeds and fibers and feed them to your chickens! 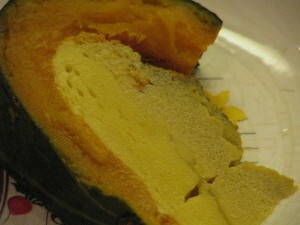 I just happened to have a 2.5 lb homegrown Kabocha squash handy, so I made the recipe (adding a little cinnamon). Not wanting to be scared alone, I brought the whole cooled squash over to my friend Lara’s house, who helping me fulfill last year’s New Years resolution by teaching me basic piano. Being a vegetarian and a loyal friend, she was game to try it. It came out very good. I was impressed. I will do this again! Troubleshooting: whisk the ingredients together. I thought I’d be fancy and put them into my VitaMix on the lowest setting, but even that added a little too much air to the custard mixture. Don’t fill all the way up. Steam the lid off to the side. The top of the custard that I could see was yellowish, and I figured that this was due to the dark yolk in the eggs from my chickens, but I don’t know. Once cut into, though, the custard as a lovely white. I turned my steamer on high until it was boiling, then turned the temperature down low and the custard wasn’t done in the allotted time. Next time I’ll keep it at a higher boil so that the steam is hotter. I cooked it much longer (I think too long because I was doing other things) and the squash split a little as it was very soft. I kept it in the steamer with something between the soft side and the inside of the steamer so that the squash would keep its shape as it cooled. After it was room temperature, I put it in the refrigerator for a short time and it the squash didn’t fall apart when I removed it. Creamy coconut custard and dry delicious squash. Ms. Kiang-Spray states in her article that this recipe is known in Thailand as Sankaya and is a classic dessert. With all the eggs and tasty squash, I’d call this breakfast or lunch, too! A simple, fun, lovely dessert that people will remember as they get their beta carotene. 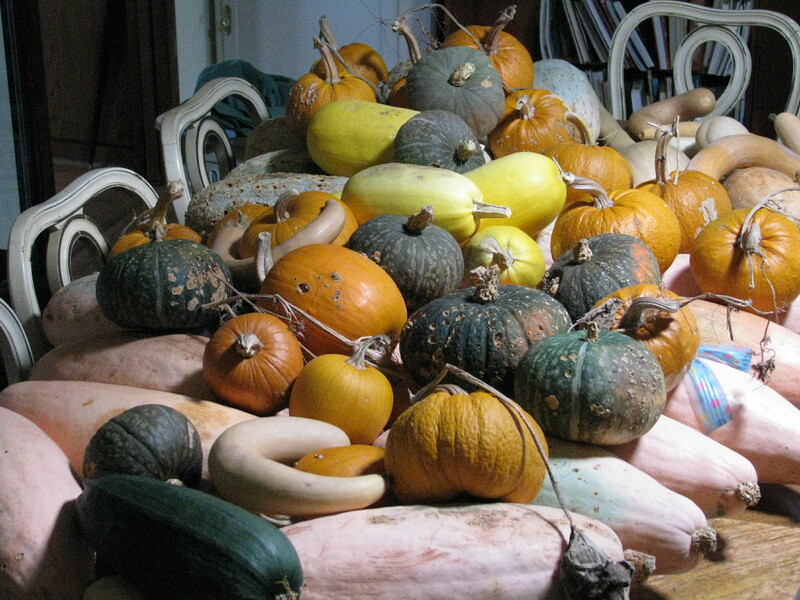 1 2 -3 pound dry-fleshed squash such as Kabocha or Thai pumpkin. Bring two quarts of water to a boil in the bottom half of a steamer pot. Use a cup to trace a circle around the top of the pumpkin. Cut the lid off around the guideline. Hollow out the inside with a spoon, making sure to get all the fibers. In a bowl gently whisk until combined the rest of the ingredients. Place the squash into the steamer basket. 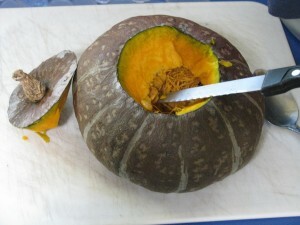 Pour custard through a sieve into the pumpkin leaving an inch to the top (filling will rise). Include the squash lid next to, but not on top of, the squash. Steam covered and undisturbed for 55 minutes until a knife inserted into the custard comes out clean. Remove steamer basket from over heat and allow squash to come to room temperature. Slice into wedges (in front of admiring company!) and serve. I’m not big into candy; give me cake, pie or bread, or a good rice pudding instead. 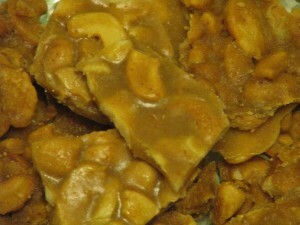 However I’ve made this brittle at Christmas for years now, and it is always a big hit. The cayenne makes a nice mild burn to counter the sweetness of the brittle. Cayenne is good for you, too, as are cashews (no matter how creepy it is that cashews grow! ), so it makes sense in some distorted way that this candy is good for you. It is so easy, too. I have much less salt tolerance than the general American public. If I eat out I find myself desperately thirsty for days. The original recipe was made for high salt intake, but I have shown options on cutting it back. You don’t need it, for the delight of the candy is in the burn with the sweet. I also don’t like very hot (spicy) foods, but I like this. Make some and try to share. A yummy easy-to- make brittle with a slow spicy burn. Butter a nonstick baking sheet and set aside. Combine all the ingredients in a large nonstick skillet. Stir mixture over low heat until the butter melts and the sugars dissolve. Increase heat to medium and boil. Stir constantly until mixture turns golden brown, thickens and masses together, about 5 minutes (if you cook it longer it won't be as shiny; too little and it will be soft but still yummy). Immediately pour candy out onto the prepared baking sheet and quickly spread evenly using a spatula to help.